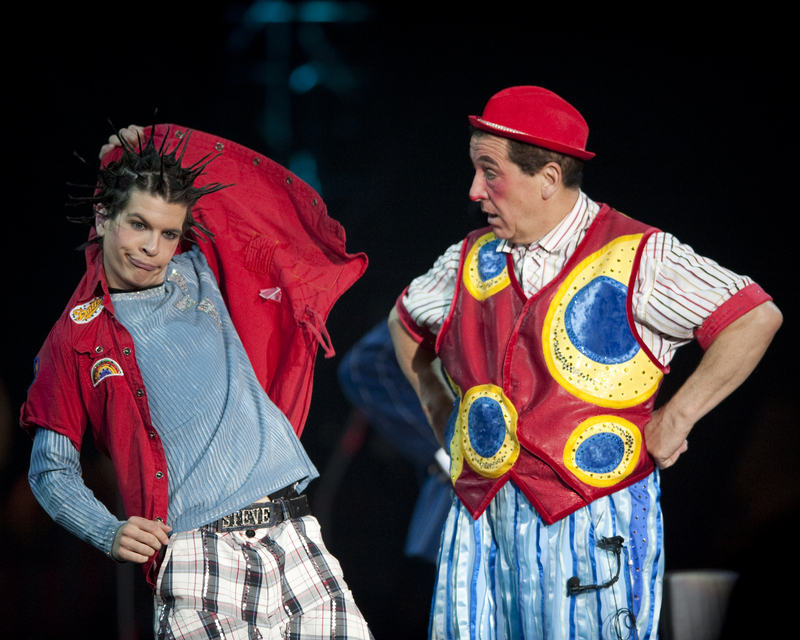 Steve Caveagna is an extraordinary circus performer at Ringling Bros. And Barnum and Bailey Circus. This 18-year-old grew up in a circus family. Before beginning the interview, let’s review the family history of this creative group of clowns. Combining their musical talents along with their natural flair for comedy, the Italian Clowning Caveagna Family has found the perfect balance between the classic and modern art of clowning. Playing trumpets and various saxophones, the trio intertwines their playful music throughout their zany antics, as part of the cast of Ringling Bros. and Barnum & Bailey® presents IlluscinationSM. The well known family act consists of father, Artidoro, and his two sons, Jones (pronounced Yo-nis) and Steve. A second generation performer, Artidoro learned this one-of-a-kind art form from his father Elicio, who was not only an accomplished musician but also a revered clown in Italy. Elicio performed this act for several years in a prominent Italian circus, Circo Nando Orfei, where his performances were legendary. Hoping for his legacy to continue, Elicio taught the craft to Artidoro who later mentored his two sons- Jones, who joined the act when he was 20 years old and Steve, who began performing the act when he was 10. The family’s popular act is recognized throughout Europe and has been performed in notable circuses such as Circus Nock in Switzerland, Weinacht Circus in Germany, and various galas and events in France. The trio has also showcased their act in several circus festivals with performers from all around the world. They were awarded a Bronze medal in the 2004 Passauer Festival and a Bronze and Silver Medal at the 2005 and 2006 Festival International de Namur. Making his American debut with The Greatest Show On Earth®, Steve Caveagna hopes that their unique style of clowning will be enjoyed by children of all ages as he shares his passion and laughs during his two-year tour. AK: At what age did you decide to become a circus performer and what inspired you to join the circus? SC: My father and grandfather were both performers in the circus, so I was really born into it. My grandfather had taught my father and my father taught my brother and me but it wasn’t until I was about 10 years old that I decided to follow in their footsteps because I was very shy. After a couple of years of practicing to become a clown, I became more confident and outgoing. We started with a circus in my home country of Italy and now we are traveling the United States with The Greatest Show on Earth in Ringling Bros. and Barnum & Bailey Presents Illuscination. AK: What is a typical day like at the circus for you? SC: It’s hard to describe a typical day at the circus as there is always something new and different going on, but normally I’ll wake up, drink a cup of coffee, eat some breakfast, and then begin to do my spiky hair while I listen to music. My hair normally takes about two hours. 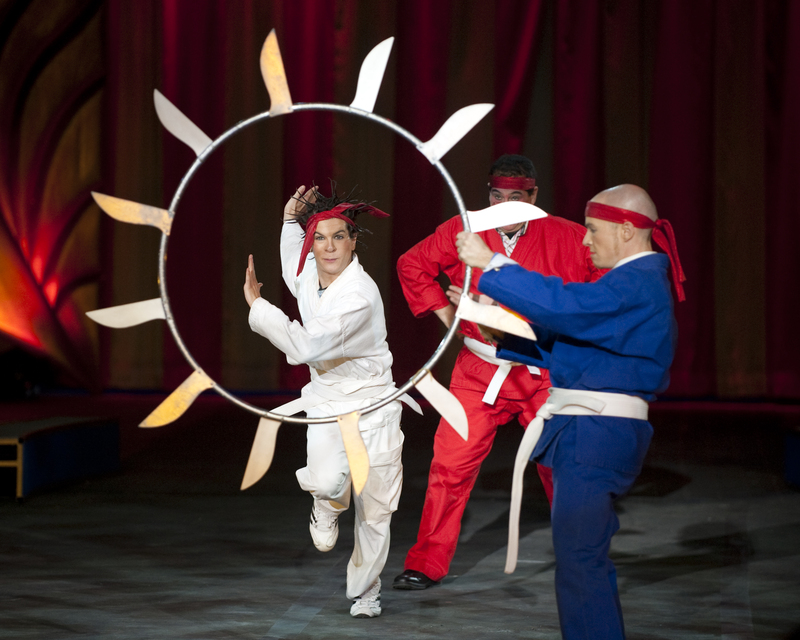 I then go into the arena and put on my makeup on and practice the Diabolo, which is a juggling prop that consists of a spool being tossed and whirled on a string attached to two sticks, (it’s my specialty), and then I get ready for the show. Some days I get up early to do interviews and or visit schools and hospitals to put on a special performance. AK: What is one of your favorite routines? SC: My favorite act in Illuscination has to be the act that my family and I perform in. 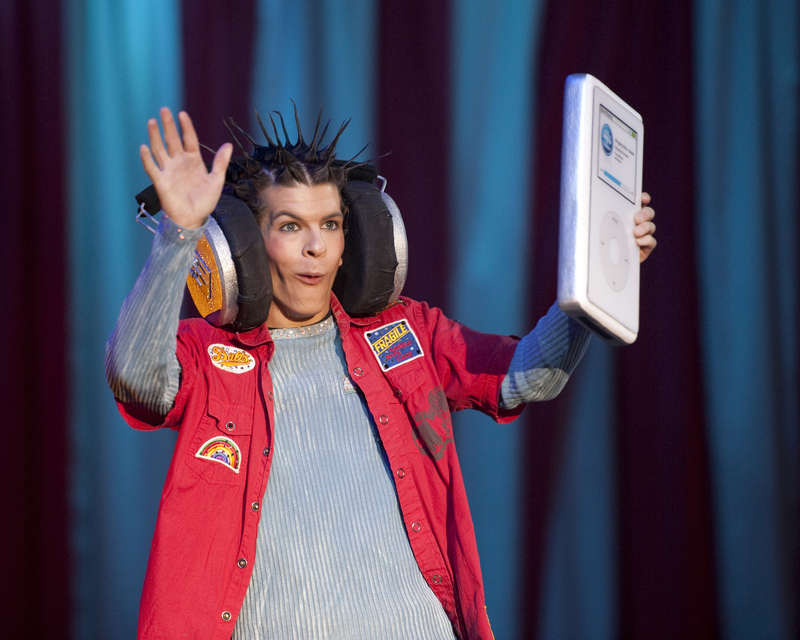 The act is called Boom Boom Pow; it’s my favorite act because I get to interact with the audience and have fun with them. Plus, I get to perform with my brother and father, so it’s a good combination. AK: Are you part of a traveling circus, or do you typically stay in one place? SC: I travel with THE GREATEST SHOW ON EARTH. We travel all around America by recreational vehicles so every week we are in a different city and usually a different state, and I get to meet different people. It’s a cool experience and I’m enjoying every minute of it. AK: How many hours do you have to practice in a week? SC: I try to practice my Diabolo as much as possible, but it depends on how many shows we have each week, how much I have to travel, and how many events we have. Overall I probably practice about four hours a week not to mention show rehearsals. AK: What is it like living and working with other circus employees all the time? SC: Living and working with other circus employees is an amazing experience. We have performers from all over the world so to be able to learn different cultures, languages, and trying food from their country is really cool. On Ringling Bros. and Barnum & Bailey Presents Illuscination we have nine different countries represented and we all help and learn from each other. It’s like we are one big international family. AK: What skills do you think are needed to be a successful circus performer? SC: In order to be a successful circus performer I think you need to find a talent that you are passionate about. I was passionate about clowning because my grandfather and father were clowns and I really looked up to them. They were able to combine their love for music with the art of clowning to create a new unique style and I loved that. The other reason that I got attracted to clowning was the ability to put smiles on the faces of thousands each night; it’s an awesome feeling that I can do that. AK: Are you planning to be involved with the circus your entire career or do you have other plans? SC: I hope to be a circus performer and with Ringling Bros. and Barnum & Bailey for as long as possible. Working with my family and being able to perform is something that I truly enjoy and I couldn’t imagine doing anything else. AK: Who has been a mentor for you that has helped you reach for your dreams? SC: Other than my family who I’ve looked up to and have helped me and supported me throughout my career, I would say that I am my own motivation. I want to be the best that I can be and that is what motivates me. In order to create and build my own character I watched a lot of comedy shows to get inspiration from but a lot of my character has come from within me and my desire to succeed. AK: What advice do you have for kids that are interested in pursuing a career with the circus? SC: Being a performer with The Greatest Show on Earth is a lot of work but it is also a lot of fun. The best advice I can give to someone is do what you feel is right for you and find the right people to help you with this. The last 2 times that I have been to see this show with my kids they have recognized him. 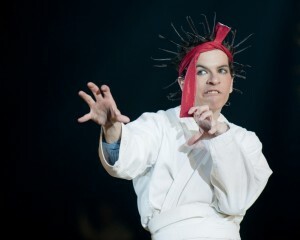 They refer to him as “the guy with spikey hair” and they absolutley LOVE him and the Boom Boom Pow act. I have to admit that he is also my favorite of the entire group. Little man is HALARIOUS and a rising star! 🙂 Makes the money spent well worth it!!! I saw this guy last night, and HE STOLE THE SHOW! He’s hilarious! My 8 year old nephew LOVED him! When I asked him his favorite part of the show, he said this guy, LOL! And he’s a nice guy, too. Before the show you can meet the performers, and he took a picuture with my nephew, very cool! My nephew has shown everyone that picuture, saying I got my picture with the best one in the circus!